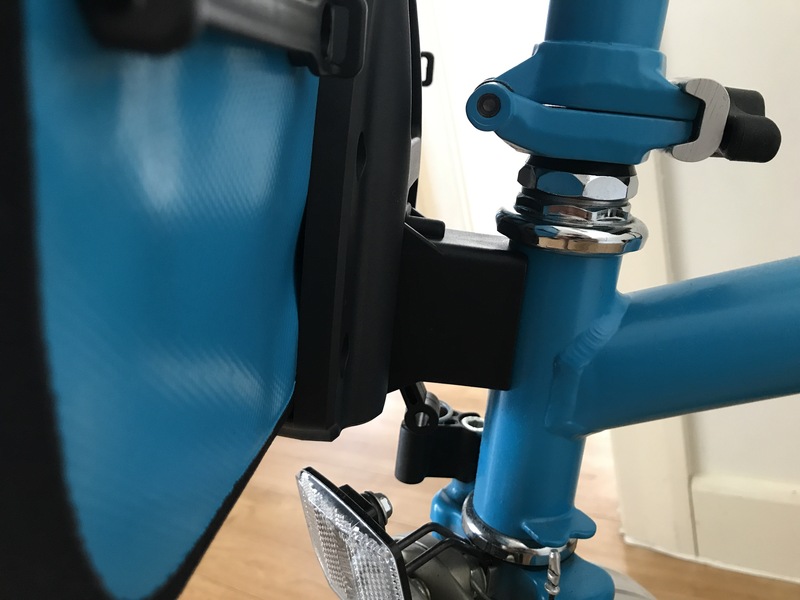 Just when you thought your Brompton couldn’t get much better or handier you stumble across the Brompton O Bag, it’s not new but it’s certainly welcome. 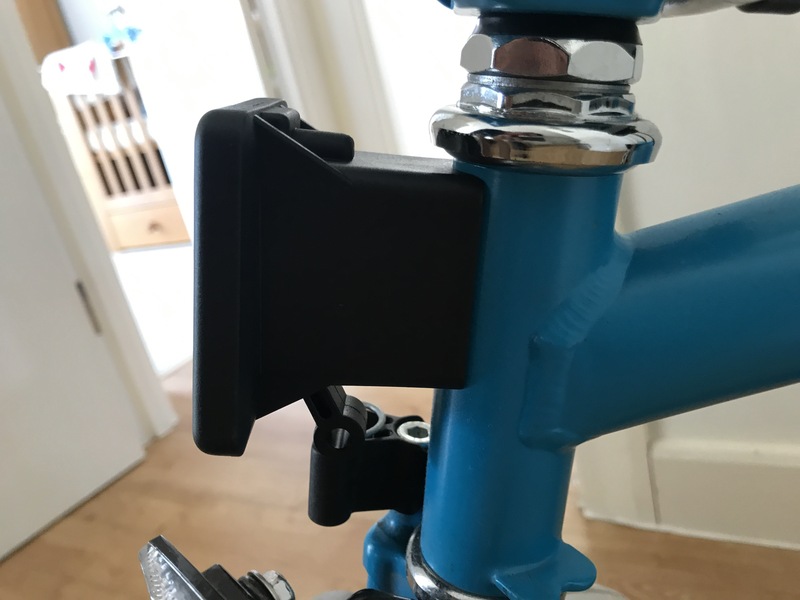 The guys at Edinburgh Bicycle Co have helped me out here and sent a blue bag to match my Brommy, perfectly. 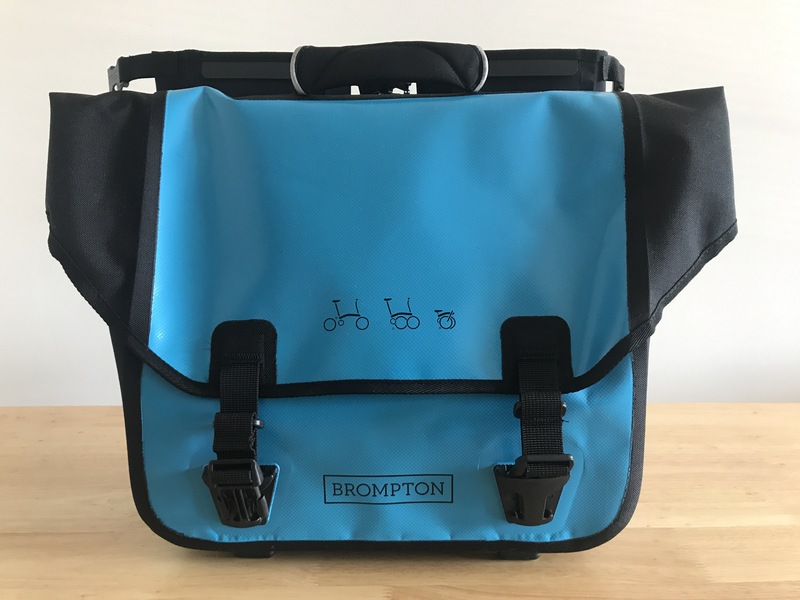 They have a whole load of Brompton stuff and you can check out their range by clicking the link here. This bag made my Ortlieb for Brompton, hence it being an ‘O’ bag – standing for Ortlieb, it’s amazingly versatile and as thought through as the Brompton on which it goes, you do need to buy a mount for the bag to make sure it hangs off your beloved folding bike though. Alternatively you can carry the bag over your shoulder, messenger style. 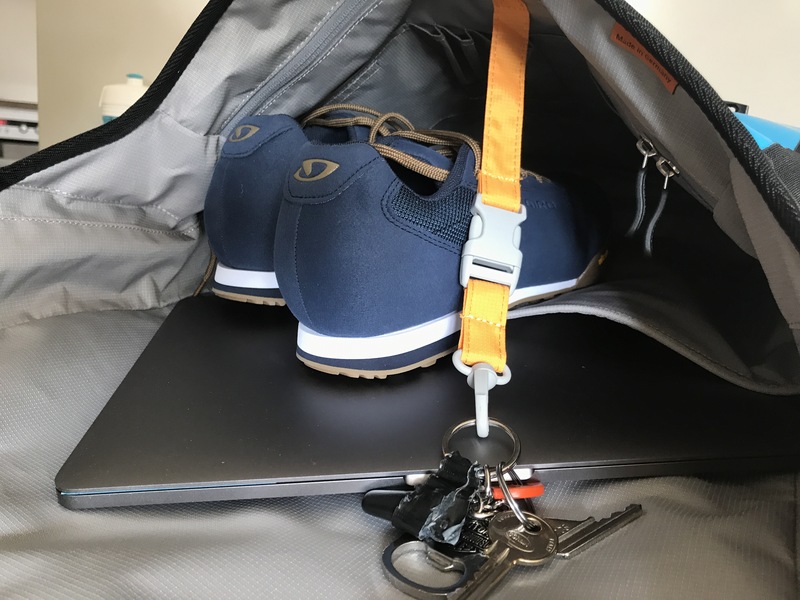 You know us here at Pusher of Pedals – when commuting we generally go for function over style but this bag has both in, well, erm… bags. It’s got a 20 litre carry capacity, and two extra attachable dry bags, these will solve your no water bottle issue as both with easily hold a 750ml water bottle. Inside of the bag there is room for your laptop, a holder for your keys and other little pockets too. Plenty of room for all of your stuff. 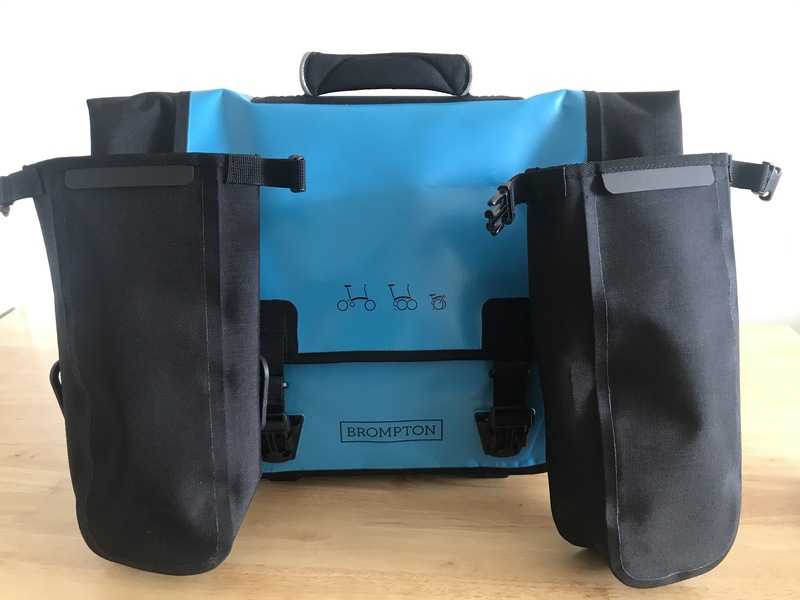 What else, the reason Brompton approve this bag so much is because Ortlieb are market leaders when it comes to waterproofing. You could be out in the spray of the road all day and all your electrical good inside would be nice and safe. The attachable dry bags again are an excellent thought for your phone or other stuff you want to keep dry. Added to that the inside is soft, so you feel happy sliding your laptop in and you just feel like the bag will keep everything happily. When it’s attached to the front of the bike, there’s no need to worry about the comfort. The weight is barely noticeable though so that’s a plus. original outlay for your Brommy. Actually, when you compare it to that, it’s quite cheap. I can’t defend the price, all I can say is the bag is brilliant. If you’re a bloke, don’t tell your partner you’ve just spent £200 on a bag as that will just be permission for them to do so as well. Why this over a backpack? Well it’s just a bit more convineint isn’t it? Save you turning up somewhere with a sweat patch on your back because of a backpack. You can just holster the O Bag on the front of the Brommy and away you go. When you get to the other side, the messenger style of the bag comes in to its own, allowing you to slink it over your shoulder. There is also a comfortable top grip for the bag if you don’t fancy it over the shoulder. The little lever on the bottom there releases the bag. We should say here that the messenger strap is detachable, perfect for when there is rain in the air. You don’t want to have to have a soggy strap over your shoulder! How easy is it to attach to that little rack thing? So easy, just slots in to place. Next question. If I was buying a Brompton I’d more than likely get this bag as well, I’d buy them both at the same time so the cost doesn’t seem as much. I don’t think I’d buy it afterwards, the stumbling block of £200 would put me off. Absorbed in to the price of the bike and if you were commuting each day… so worth it. Rain or shine you’ve got a great bag.